We are noticing problems with the Read Online links for e-book records in our Discovery Service ("Hello. Looking for Something?" box). For some of our vendors, such as Springer and Sage, the links go to a Page Cannot Be Found error page. Until we are able to resolve this problem, please click on "Look in Library Catalogue" and then click on the "Online - Click to View" link. We apologize for any problems this may be causing you. Posted by Patti, Oct. 20, 2015. The Chilliwack library computer lab – A1202 – is now open longer hours to better serve students wanting computer and printing access and a place to study weeknights after the library is closed. 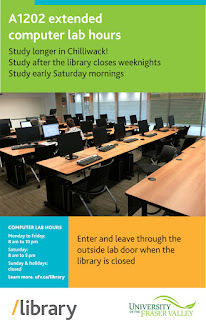 The lab is also open before the library opens on Saturdays. Chilliwack library and IT wanted to provide the maximum service hours possible to help students succeed. Just in time for crunch-time, study later, study earlier and study longer in Chilliwack! The 2015 Election Party Platforms are available from our Canadian Electronic Library provider.